You're looking for a great way to organize your anecdotal notes that you have from conferring with students, right? How about those small-group plans... Are they organized? How about flexible grouping... Do you know which students are making progress with which specific goals? Well, this Conferring Notebook is just the tool that you need! The compressed folder contains a .pdf document and a .ppt file. The .pdf has everything you need to set up a binder that will hold all of your notes and records along with suggestions for use. The .ppt file has only the forms in an editable format. You can insert text boxes directly onto the pages to print student names or other notes that you'd like to type onto the document. The entire contents of this binder system is included in the preview file. 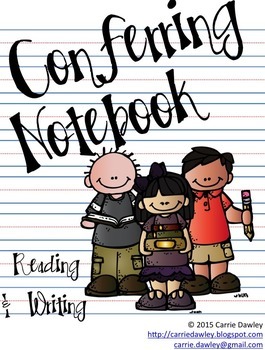 If you like this Reading and Writing Conferring Notebook, check out my Math Conferring Notebook! If you're looking for a way to keep data organized in all core content areas, check out the bundle [here]! Conferring Notebook - Kid Theme - Editable Forms Included by Carrie Dawley is licensed under a Creative Commons Attribution-NonCommercial-NoDerivatives 4.0 International License.